One mile of Nordic walking engages the abdominal muscles and contracts the lateral muscles. 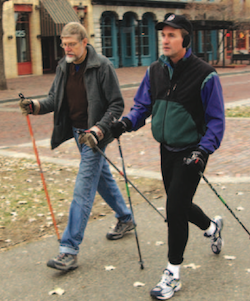 The ergonomic handles of the Nordic Walking poles absorb the shock and vibration when hiking on city concrete. When you use exercise walking poles you will be reducing lower joint impact because the Nordic pole handles transfer the energy to help prevent joint injuries while giving you a full upper body workout too. 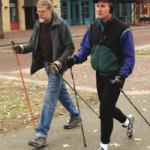 Walking poles come in different composites, lengths, and weights. Aluminum are light and the carbon fiber are heavier. If you want your Nordic walking poles for mostly hard surface and high mileage, you may want to consider a pole with a higher proportion of carbon fibre. Nordic walking poles come with wrist straps and / or grips. When utilizing the straps with proper technique they are used to travel the pole instead of having to tightly grip the handle. The strap styles can be looped, a sling type, or a fingerless glove. Nordic walking pole tips have rubber tips or metal tips. The rubber is used for hard surfaces like city concrete and the metal tip is for trails, ice and snow. When deciding on what Nordic walking pole to buy, determine your uses of the poles and while considering your budget ensure there are replacement parts available. It won’t do you any good to be waiting 6 – 8 weeks for a part while the season is wasting away. Adjustable walking poles are telescopic and adjusted for your height. 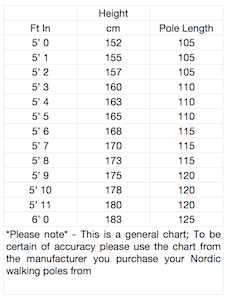 A non-adjustable shaft Nordic walking pole will need to ordered at the exact length you require. Convert your height from inches to centimeters and multiply by 0.68 and round DOWN to the nearest pole size. Other things that may determine the appropriate pole length are hip impairments and leg length and the terrain you will be walking on. 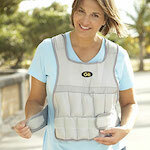 A shorter pole may be recommended in these cases but you still get to decide which is most comfortable for you.